Works great! This was the first program that showed issues with my SSD's and one of the Insider builds I was using. I followed up with hm64 to confirm it ( the portable version). Those of you that are worried about adware or toolbar's, use the portable version...NO ADWARE! I have a folder on my C drive that I unzip all portable programs in, then pin the application to my start page or taskbar. I have never had a problem with adware, toolbar's, etc, with any of them. Tried this (and several other programs by same author). Defaluts to insisting it install a widget (??) to change your search engine; with no way to deselect that choice. Thanks, but no. Widget, toolbar, change my search engine all get a quick trip to the trash bin for that software. Very useful tool mainly for internal hard drives. 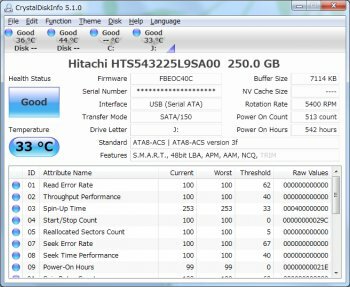 Does not report the correct SMART infos for my external Western Digital 1TB drive. WD Diagnostic tools report this correctly and it is different! This is a useful program. good for checking the overall hard drive health. "noob only started being used years have newbie." Can anyone translate war593122's nonsense? Continues to work well with the drives that I have got. Helped also in showing a retailer, along with other diagnostic software, of the problems I was having with a Samsung HD and thus got refunded. A useful part of a tool-kit which compliments others and can be invaluable if you think that you are having HD issues. 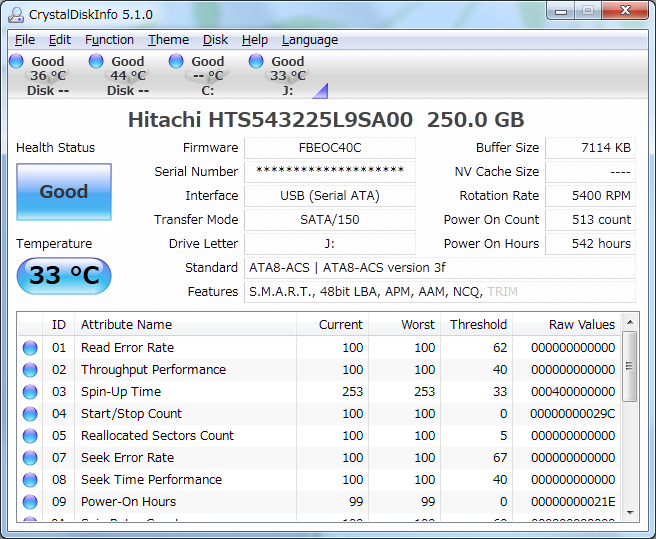 mike59, so what your saying is SMART is only way to get hard disk info? noob only started being used years have newbie. So I guess that makes you the noob? An excellent piece of software that continues to be developed and supported. Raid arrays hardly ever pass SMART info n00b. Does not even see my main C drive where windows is installed. Using a very popular Raid 0 setup using two WD VelociRaptor drives. Knows nothing about my external D drive using eSATA. Also, web site does not even list Windows 7 as supported OS.. Fix this and I give it another try.. There is incompatibility between some HDs regarding Power On Hours - Crystal Disk Info determines true amount of hours by detecting changes in this SMART parameter. It also have detection option for changes in Pending Sectors, Reallocated Secors and UNC errors. Any non-zero value on this fileds means that HD cannot be trusted anymore. CDI is perfect tools for frequent checking of these parameters. Nice but it gives different results to SpeedFan 4.41which is my normal SMART monitor. Why would the interpretation of a digital data stream be different between the two programs? CrystalDiskInfo warns me about one of my drives (normally 4 with additional 2 external eSATA) whereas SpeedFan does not. The drive in question is the same as the one in the image above, a Samsung HD103UJ. The drives typically have about 8500 hours on the clock.